This impressive illusion by Shigeo Fukuda is sure to boggle the mind. 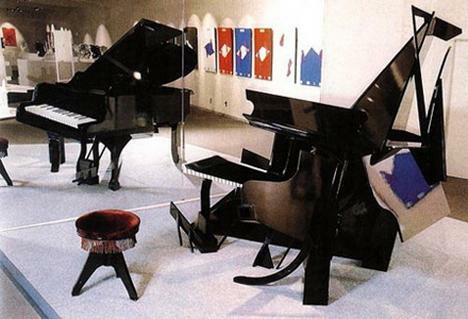 On the right we can see a strange structure made out of various piano parts and shapes, yet when viewed in the mirror on the left the reflection is of a completely normal looking piano. Wow, this one must have taken a lot of time and patience to do. It's so amazing! I think the man who did it, is so smart, resourceful and intelligent. Wow! That was just so cool. It sure must have took a long time to accomplish. This is fake it is a normal wall and they painted a piano on it so it is fake. The reflection isn't quite "perfect". The issue is with the shadows that are cast. One can see by the shadow cast by the stool onto the rug that there is a single light source. None of the shadows in the reflection fall within the same perspective lines. Awesome work of perspective however! Amazing at first but if you look carefully the shadows of the reflection are in the wrong places! Lol, awesome though! I'm just being picky, must've taken a lot of time and effort. It was worth it as well! STUPID!!!!!!!!!!!!!!! this is so obviously just a wall painted to look like a perfect piano and a reflection in the mirror. CAN'T belive u fell for this. OMG!!! this stuff is making my head hurt!!! This might be cooler than my videos!